Set of 7 different field guides & manuals to use for studying for the NCCCO crane operator exam. VISTA has researched and created a set of books and field guides for you. If you understand the topics covered by these books, there is a good chance you will do well on the NCCCO or other crane certification written and practical exams. The most authoritative text on mobile cranes ever published. Endorsed by the world's foremost authorities, this book is consistent with most national standards. 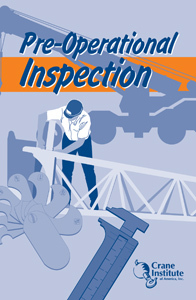 Clear, concise and extensively illustrated for practical, on-site application by all operating and supervisory personnel. At 419 pages with over 500 illustrations and more than 150 load chart exercises for 17 different types of cranes, this is your comprehensive resource on mobile cranes. Used internationally as an official course text in training and upgrading programs, this book is an essential reference in preventing costly and often deadly crane accidents. IPT's Crane and Rigging Training Manual is an essential resource for anyone who moves heavy loads. Referred to by many as the best crane and rigging book in North America, this indispensable publication expertly explains the rigging process for classroom instruction or workplace reference. New sections include pre-lift planning, materials handling, aerial platforms and barge, ship and offshore cranes. IPT's Crane and Rigging Training Manual is the first choice for many trade colleges and apprenticeship programs. With clear, concise rigging process explanations, along with detailed diagrams and charts, this handbook or manual is the only crane and rigging reference you'll ever need! Training Manual: 8 1/2" x 5 3/4"Comes with answer booklet! Provides a thorough introduction to many of the essential practices and procedures employees need to be familiar with before beginning work around lifting equipment. Site preparation, Unstable Ground, Clearances, Crane Positioning, Use of Outriggers and Blocking, On-Rubber Operations and a complete checklist.. Train your workers in hoisting personnel with our handy hoist operator training book! 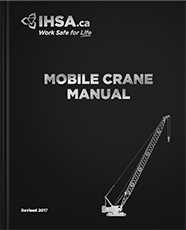 This crane hoisting safety booklet covers Pre-Lift Considerations, Platform Specifications, Crane Selection, Rigging Selection, Trial Lifts, Lift Preparation, Inspection, Lifting to Location, At the Location, Lifting Over Water, Complete Checklist. Key Points, Machine Inspection, Walk-Around Inspection, Wire Rope, When To Replace Wire Rope, Safe Wire Rope Criteria, Pre-Operational Test, Safety Devices, Cranes Not in Regular Service. Pre-Lift Meeting, Maintaining Clearances, Signal Person, Tag Lines, Warning Devices, Restricting the Work Area, Driving Under Power lines, Response to Contact, Emergency Evacuation, Post-Contact Procedure, Complete Checklist.